The biggest single argument against naming Abrams at the beginning is that it just hasn’t been done before. [Pols emphasis] The closest parallel is Ted Cruz’s last-minute desperation gambit to name Carly Fiorina as his running mate in the closing stages of the 2016 primary. The fact that the combined charisma of Cruz and Fiorina was not enough to overcome Trump’s big lead hardly proves it can’t work. If anything, the lateness of the maneuver gave it a whiff of desperation. If Biden does wait, and his polling lead starts to melt, naming Abrams will have the same pitfall. The Cruz example argues for joining with Abrams on Day One. The more we think about this, the more intriguing it becomes — primarily because it’s different. In a field of dozens of Democrat candidates, different is good. Is It a Good Idea for a Presidential Candidate to Choose a Running Mate Early? If Biden wants a woman of color, why not Kamala Harris? She has actually won a major race. Of course, she's my number two choice for president, after Amy. A. Sen. Harris is already running. Part of why I oppose the idea of choosing early is because it limits your choices (a colleague in the race could turn out to be the ideal VP nominee; see: Biden, J.). B. He may be looking at the primary map, where the appeal of a southern Democrat is probably greater than a Californian Democrat. Biden should already be strong in the Midwest and around DC, locking in the South makes him very difficult to beat mathematically. C. She nearly won Georgia. Much like Beto, the idea of putting more states into the purple category is enticing, especially Georgia where the media market in Atlanta dominates the state (like CO, NV and NH, more than half the population is in a single media market, so you get more bang for your buck when buying ads). It’s a terrible idea for anyone, not just Biden. You’re really gonna’ risk your entire presidential candidacy on nearly two years of oppo-research and attacks of your only preliminarily-vetted running mate? You’re also ruling out selecting any other Presidential candidate who might be a great Veep, who draws a huge constituency following in the primaries, simply because she also has, as yet, unrelinquished Presidential aspirations? It’s almost like the Democrats are so brainless they’re actually working to get mangoman reelectoralcolleged? 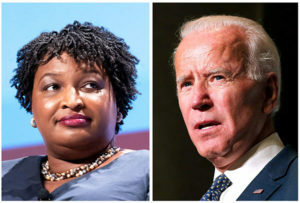 And, I understand the demographics, diversity, and age concerns, but . . .
. . . here’s another consideration (especially in the case of a Biden running mate): How about picking your running mate based upon his/her/their qualifications to assume the Presidency??? Wouldn’t that also be something pretty much “intriguing — primarily because it’s different . . . Different is good.”? I mean, OK, I know that’s a joke, because that’s rarely ever done, but can’t we at least pretend that’s what might be really important, and also “different”?? Cuz’, remember kiddies, different is good! . . .
And by the way … Abraham Lincoln selected a Democrat as Veep in 1864, trying to be a National Union Party. Robert Taft tried to draft Gen. McArthur as Veep in 1952. Reagan tried to leverage himself into position by naming Sen. Richard Schweiker as his running mate in 1976. Jerry Brown tried it in 1992, naming Jesse Jackson as his presumptive VP. In short, it is a time-detested strategy.